The Million Man March on Monday, October 16, 1995 in Washington, D.C.
(FinalCall.com) - Those living in Memphis, host city for this year's Oct. 16-18 annual Holy Day of Atonement commemoration, have been working around the clock for several months as many travel to the capitol of the mid-south to mark the 14th Anniversary of the Million Man March. The Honorable Minster Louis Farrakhan, scheduled to deliver the keynote address marking this year's Day of Atonement commemoration, told The Final Call the focus will be on pooling resources, to do what needs to be done to produce that which is needed for the Black community to survive these tough economic times. “We hope to gather many, many people from Mississippi, Arkansas, Alabama, Georgia, and the Deep South to come up to Memphis. We need land. Since America is being bought up by forces outside, we need to pool our dollars to buy huge tracks of land that we can begin to build an economy for ourselves. We need to think about how to fulfill the prophecy (Isaiah 61:4) where it says, ‘And they will rebuild the wasted cities.' We need to be prepared to build our communities,” said Min. Farrakhan. “If there are ten million or more people out of jobs or six million or five million, President Obama is trying to create jobs, but for whom? Will we be able to fit into the green economy?” the Minister asked. Memphis, located in the southwest corner of Tennessee, has an estimated population of a little under 670,000. It is the largest city in Tennessee, and the 19th largest in the U.S.
Student minister Anthony Muhammad of Muhammad Mosque No. 55, the hosts of the commemoration, told The Final Call they are looking forward to seeing everyone's safe journey by bus, car or airplane for a weekend of problem solving, fellowship and culture. “We are very excited, honored and looking forward to seeing all of the Believers coming here from all over the country,” said Anthony Muhammad, adding that with the help of a committed cadre of Muslims, they have worked with city officials for the last eight months to plan the weekend of events. On October 16 a leadership forum and roundtable discussion is scheduled with prominent business, political, civic and spiritual leaders from within the community hosted by former mayor Dr. Willie W. Herenton, Vice President of Operation PUSH Dr. L. Lasimba Gray, SCLC Memphis Chapter President Dwight Montgomery, Shelby County Commissioners Sidney Chism and Henri Brooks. The leadership forum will be held at the Civil Rights Museum, located at the Divine Lorraine hotel where Dr. Martin Luther Jr. was felled by an assassin's bullet in 1968. The hotel has now been converted into an historical landmark and tours will be available to the public throughout the entire weekend. On October 17 at 2 p.m. there will be a health fair and town hall meeting discussing health in the Black community at the Memphis Cook Convention Center, and later in the evening, a free talent showcase and concert is scheduled, drawing gifted performers from all different cultural genres with entertainment appropriate for all ages. The Honorable Minister Louis Farrakhan's keynote address will be delivered from the Memphis Cook Convention Center on October 18th at 2 p.m. and will be carried live via internet webcast at www.noi.org. The overwhelming event which took place October 16, 1995 drew over two-million Black men to the steps of the U.S. Capitol. The men who made the journey indicated that the themes of atonement, reconciliation and responsibility resonated with them, and the gathering symbolized the willingness of Black men to atone to God for shortcomings as men, husbands and fathers, and demonstrated their willingness to reconcile differences at home, school, church, organizations and in the society. 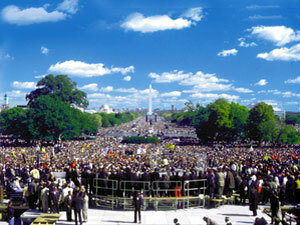 The 14th anniversary of the Million Man March comes at a time of great change in America and across the world. Leading up to the march, back in 1995, Minister Farrakhan traveled across the United States challenging Black men to stand up and strive to reclaim their families and communities. Many who participated in the Million Man March said the day, and the events leading up to it, are still etched in their memories. “I think it is important not to view the Million Man March in a vacuum; we should put it in historical context and see it as part of a historical continuum that began long before 1995 and has continued to this day,” said Zaheer Ali, who was the assistant to the National Executive Director of the Million Man March, Dr. Benjamin Chavis. “The Million Man March was a powerful re-articulation of the nationalist tradition in the Black freedom struggle, emphasizing self-help, individual responsibility, and community development. Those ideas, along with other strains of thought within the Black freedom struggle, will continue to be relevant as long as racial disparities exist in our country,” said Mr. Ali. It was the state of the Black man that gave relevance to the gathering and spawned subsequent offshoots such as the Million Woman March, the Million Youth March and Movement, the Million Family March, and even the Million Worker's March and Million Mom's March. It was the spirit of the Million Man March that resonated with the spirit of the men who responded to the call, said community leader, veteran radio broadcaster and businessman Bob Law, who served as the New York State Chairperson of the Million Man March. “The Million Man March resonates in the hearts of more than a million Black men, and it is still the rallying cry that would gather black men coming together,” said Mr. Law in a telephone interview with The Final Call. “I saw a brother who is a derelict walking down the street near my restaurant looking for a hand-out and I gave some money and I said to him, ‘Brother, this is from the spirit of the Million Man March,' and he stood straight up, and he said, ‘The Million Man March, Yes Sir!' and there are other experiences like this one,” said Mr. Law. Mr. Ali agreed and said the success of the march can be measured quantifiably and qualitatively in the affect on the men who attended and on the local communities. “The number of children who were adopted, the increase in Black male voter participation in the ‘96 election, family reunions with previously absentee fathers, and the increase in Black civil participation in churches, mosques, and organizations. But just as important was the ways the Million Man March affected people qualitatively: the Million Man March represented a tonal shift, a counter-narrative to the prevailing images of the Black ‘menace to society' that were being piped through media at the time,” Mr. Ali said. “That was one of the best days of my life,” said Student Minister Anthony Muhammad, adding that looking back fourteen years later, he is wiser and many of the men who attended were wiser. “That march changed the lives of many men and the difference is the wisdom that comes with that—fourteen years later—I am wiser than I was then, and the one thing we failed to learn how to do is to work with one another. We wanted to but I think we have now learned that it is imperative that we learn to get along. It is time for us to work together,” he said. For more information regarding the Holy Day of Atonement in Memphis and the weekend of events, visit http://www.holydayofatonement2009.com or call 901-523-2560.